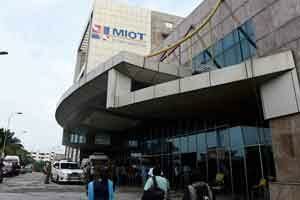 Chennai: The MIOT Hospitals denied the charge that its ‘neglience’ had caused the death of 18 patients due to lack of oxygen when its generators were reportedly flooded in the heavy rains last year. The hospital stated this to the notice issued to it by the court on a petition by social activist ‘Traffic’ Ramaswamy who had levelled various charges against it. He had also sought a direction to police to initiate criminal action against MIOT Hospitals for ‘willful negligence’ and to authorities to demolish ‘illegally’ constructed buildings.